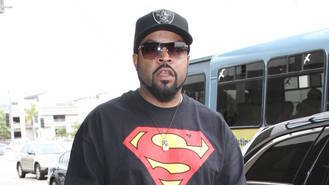 The rapper teased fans with the promise of a reunion back in January (16), and said he was "gonna try to bring the members of N.W.A. together... To give everybody a little history lesson on Ice Cube and N.W.A., Westside Connection, everything I've been doing over the years." And true to his word, MC Ren and DJ Yella joined him on stage for a highly-anticipated comeback, performing Straight Outta Compton, Dopeman and the infamous F**k Tha Police, a track Ice Cube was reportedly told backstage not to perform. Straight Outta Compton movie star O'Shea Jackson Jr., who played his father Ice Cube in the award-winning biopic, also made an appearance, as well as Common, who performed a track from the new film Barbershop: The Next Cut with his fellow rapper. Snoop Dogg helped close the set, and rode out on stage on a sparkly tricycle to wild applause and screams from the crowd, before doing Go To Church and Lodi Dodi with Cube. The rapper's set wasn't the only one to feature plenty of guest stars, as Brit electro duo Disclosure also had two big names that performed during their set. Lorde sang Magnets with the brothers, while frequent collaborator Sam Smith belted out their track Latch. "Oioiiii @coachella... Been waiting to play this stage for ever and today is the day!! See you at 7.35pm everyone!" Disclosure wrote on Saturday.